Help! How can I get rid of this white stuff all over my pool tile? If this is happening to your pool, then you know what we’re talking about. This usually appears as a white line along your waterline tile or often a white haze across/over your spillover. And it really stands out when water level drops or when the area dries out. What you are noticing is a buildup of calcium coming from behind the actual tile. Do not fret, we can help! 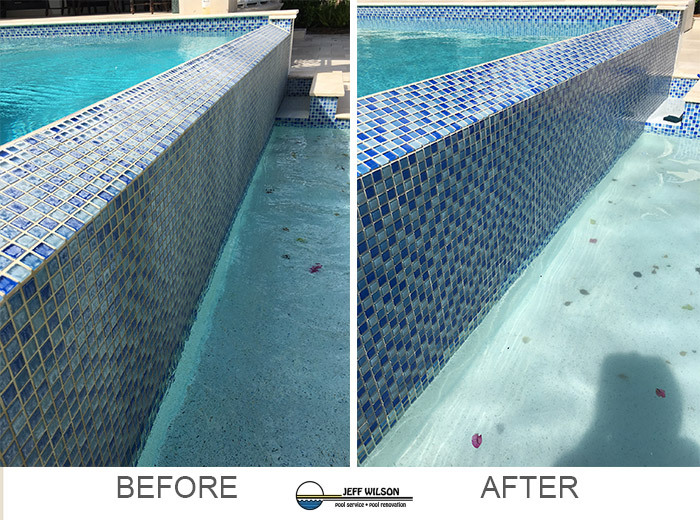 Our craftsmen will use a specialized process to manually restore your pool tile to its original glory. See below for some recent before and after photos from some of our satisfied customers. Contact Jeff Wilson Pool Service today for an assessment and quote.